The NCAA tournament's most epic endings are the culmination of countless simple moments that lead to the improbable last shot everyone remembers. Nate Britt Sr. moved seats halfway through the 2016 national championship game, addressing his divided loyalties, or trying to. He knew who to root for—his namesake, North Carolina guard Nate Britt Jr. and his adopted son, Villanova forward Kris Jenkins—but he also knew that only one could win. Knots twisted in his stomach. He hoped for an epic ending. This buzzer beater, like all buzzer beaters, can be contained to those few seconds: play called, shot made, celebration started. 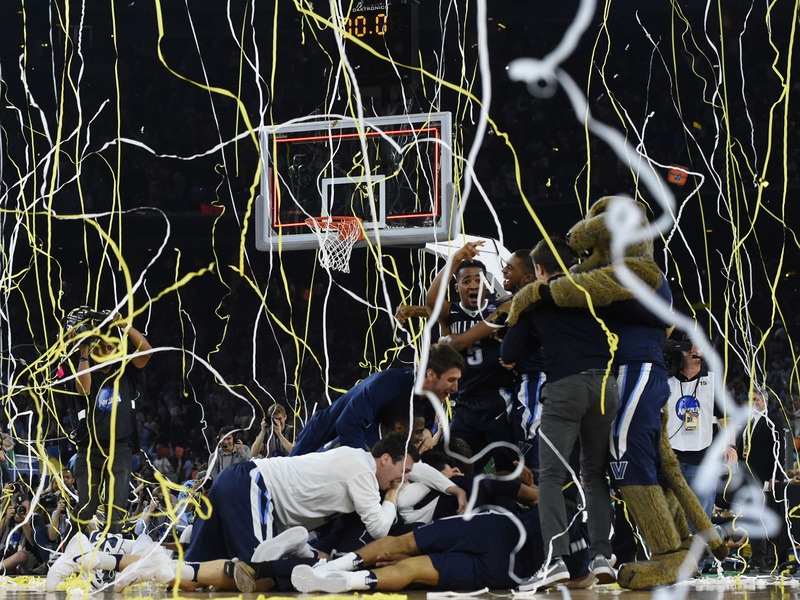 These moments, as exhilarating as anything in sports, remain forever frozen in time, spliced into gloriously cheesy “One Shining Moment” montages, shown on repeat every March. But to only look at those few seconds misses the larger point, that buzzer beaters are born from a confluence of events. They’re planned and prayed for, delivered by stars and role players, for established programs and upstart ones, and they owe to practices conducted, plays drawn, assignments missed and luck. Because so much goes into a buzzer beater, so much more comes out of one. He knew those seconds had changed his life. Knew his glory came at his brother’s expense (although UNC would seize the national title the next season and Britt Jr. would win the team award given to the player who most embodied the Carolina Way). Knew that his adopted parents felt conflicted and prideful, all at once. Mostly, “It made us feel like we did the right thing when we took Kris in,” Britt Sr. says. The Britts hung a picture of that moment in their dining room, much to Nate Jr.’s chagrin. He tried to stop eating in there. Jenkins kept his shoes, his jersey and his mouthpiece in his room down the hall. Every time Britt Jr. walked by, he closed the door. Still does. Like with any buzzer beater, Jenkins’s shot endured. Wright received videos of families accidentally breaking televisions, of loved ones who witnessed the title shortly before they died, of longtime fans who injured themselves in the fist-pumping, throat-clearing aftermath. All for what he calls “the best” buzzer beater in NCAA history. To Wright’s point, no one had ever hit a three like the one that Jenkins made. And yet, his game-winner also mimicked every other buzzer beater, from Lorenzo Charles (1983) to Keith Smart (’87) to Christian Laettner (’92) to Tyus Edney (’95) and Richard Hamilton (’98) and Mike Miller (2000). Clocks dwindled. Fingernails chewed. Heartbeats elevated. “It’s the greatest play in sports,” Wright says. An idea: The college basketball gods should mandate that the broadcaster Gus Johnson—Mr. Bam!, Pure! and Hot Sauce!—call every buzzer beaten. These moments deserve—no, demand—his verve and his voice. Like when Washington guard Isaiah Thomas won the Pac-10 tournament with a last-second three-pointer against Arizona in 2011 and Johnson screamed, “… Cold-blooded!” All these years later, strangers still shout that phrase at Thomas. Johnson, too. If made the Arbiter of Buzzer Beaters, Johnson would define them thusly: any shot, at any level, that happens just before the final horn sounds and wins a particular team the game. Heaves made before halftime don’t count. Nor do shots that drop with 10 seconds remaining. Nor do attempts drained in losing efforts, or to force overtime. None of UCLA assistant coach Tyus Edney’s players were born when Edney etched his buzzer beater in tournament lore in ’95. Bruins fans still tell him their stories every month, even ones about newborns dropped accidentally in celebration. But his players often seem surprised. “Makes me feel old,” he says. Edney still recalls every detail. The Bruins, trailing by a point in the second round against Missouri, calling timeout with 4.8 seconds remaining. His coach, Jim Harrick, pulling Edney to the side, imploring him to shoot. His star teammate, Ed O’Bannon, calling and then pleading for the ball as Edney ignored him, sped the length of the court, dribbled behind his back to clear a path to the basket, drove the lane and scored, his attempt floating just above a defender’s outstretched arm. For years, many considered Edney’s buzzer beater one of the best of all time, possibly only behind Laettner’s famous turnaround dagger to beat Kentucky in 1992. Both Duke and UCLA went on to win the national title in those seasons. Edney’s drive may also have changed the way coaches defended buzzer beaters, placing more emphasis on stopping the players who take the inbounds pass, a tactic which has created openings for teammates like Jenkins who aren’t supposed to get the ball. Edney believes shots like the one he made resonate not just because of the finality, but because everyone who ever picked up a basketball can identify with them from childhoods spent in driveways, with siblings or alone, counting down the clock: Three … two … one … When those moments unfold in real life, in a tournament defined by upsets where smaller schools can topple established powerhouses on last-second heaves, the bracket obsessives can flash back to the pretend buzzer that they beat, the shots in those driveways that hit nothing but net. No one remembers that UCLA sent six players from that team to the NBA. They remember Edney’s drive and that magical run to the title. And they can identify more with the shot than the run itself. Buzzer beaters are built more than they’re born. They might seem like one-off miracles, but they never just … happen. There’s always context involved, choices made, plays designed, sweat equity banked. And it is the nuances that help elevate a buzzer beater to its lofty perch in sports history. It’s less about the moment and more about how the moment gets made. Take, for example, the buzzer beater Michigan’s Jordan Poole hit in the second round against Houston last season. So many dots needed to connect. Poole had to watch the tournament five years earlier, see Trey Burke drain a last-second shot and decide he might want to be a Wolverine. Poole had to become a player worthy of a Michigan scholarship; the school had to offer one; he had to accept. Poole had to force his way into the rotation of John Beilein, even though the flashy freshman’s “overdose of swag” sometimes led to coach and player butting heads. He had to be on the floor. Michigan had to fall behind late in the second half, close the gap and fall behind again. Senior guard Muhammad-Ali Abdur-Rahkman had to miss a layup. Houston forward Devin Davis had to clank two free throws. Beilein had to call a play named “Indiana” with four seconds left. The coach had to tab forward Isaiah Livers, with his strong right arm that once threw 90 mph fastballs, to make the inbounds pass. Abdur-Rahkman had to shake open, coming back toward Rivers, catch the inbounds, turn, take two dribbles and spy Poole open on the right wing. Poole had to scream Abdur-Rahkman’s nickname (“Ham”) to announce that he was open. Poole had to be fearless. He had to ignore his right eye, which was watering after he had been poked there in practice earlier that week. He couldn’t see and he had to shoot. The release had to be perfect, the arc like a parabola, the ball hanging in the air and dropping through the net. Even that retelling skips a few hundred dots. By the time he returned to the locker room, the guard had 394 unread text messages. After he touched his phone, it jumped to 532. His favorites came from his parents, Anthony and Monet. Dad tried to play it cool, typing, “great shot.” Um, thanks? Mom came through. She sent an excited cat gif. This one meant something, meant more, because of everything that happened to set Poole up for the few seconds that will be shown for the rest of his life and will in many ways define him, no matter what happens moving forward. That’s what he will remember about the shot, Poole said last March: Everything that led up to it. Through his own buzzer-beating history, James Forrest can trace no less than the evolution of basketball. And it’s that very progression, he says, that led to last-second shots seemingly happening with increased frequency in recent seasons. His game-winner for Georgia Tech back in 1992 required serendipity. As an oversized 6'8" small forward, Forrest snagged rebounds and bullied his way around inside, averaging over 13 points and six boards. What he did not do was take three-pointers; in fact, by the time his Yellow Jackets met USC in the second round of the NCAA tournament in Milwaukee, Forrest had only attempted three triples all season. He had, unsurprisingly, missed all three. A defender deflected the initial inbounds pass into the stands. Only 0.8 seconds remained. Barry wasn’t open. Neither was Best. So the inbounder looked to his left, where there on the wing stood Forrest, the lumbering forward caught out of position. He caught the ball, turned, fired and … connected, in the same tournament where Laettner later knocked down his most famous shot. The Year of the Buzzer Beater, Forrest calls it. In the decades since, strangers filling up their cars at gas stations and one homeless man who recognized his face approached him. They wanted Forrest to know where they were when he made that shot and what it meant to them. The sequence was so unlikely that when Forrest watches replays he can see Cremins turning toward his counterpart, USC coach George Raveling, before his shot goes in, like his own coach expects to lose. Cremins would coin the phrase, “The Miracle in Milwaukee,” as Forrest’s shot forever will be known. For men, the NCAA tournament began in 1939; for women, ’82. 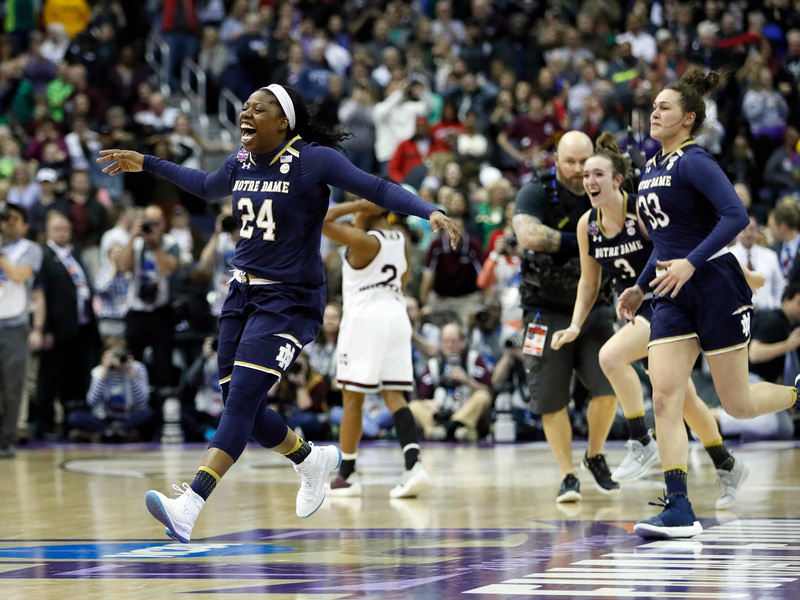 Never before had one player hit two buzzer beaters in a single tournament until Notre Dame guard Arike Ogunbowale did that last season. And she didn’t just hit two buzzer beaters but rather drained two heart-palpitating, dance-inducing buzzer beaters just before time ran out in both the national semifinal and the national championship. Her father watched both from the stands, and it reminded him of how when Arike wandered away as a toddler he’d find her with a basketball in her hands, standing in the driveway. That was his daughter, the precocious toddler who wore out the Fisher-Price hoop in her bedroom and later practiced last-second heaves, always counting down: Three … two … one. When it happened in real life, against undefeated UConn, Greg Ogunbowale didn’t know what to do. “I just lost it,” he says. “I lost all decorum and control.” A friend sent him a video from the broadcast. All he could see was himself, jumping up and down and screaming on national TV. He still remembers how the parents continued with “libations” long after the players went upstairs for curfew, the dozens of phone calls his wife returned, how he never expected the same thing to happen ever again. Until it did, against Mississippi State, only two nights later. Notre Dame trailed by 15 points late in the second half and Arike uncharacteristically botched a layup late. At that point, Greg started to consider the possibilities, the way the stars seemed to be aligning again. And there it was: Arike, ball in hand, clock en route to 0:00—another shot, another make, this time with 0.1 seconds left to win the national title, the school’s first in 17 years. "Ogunbowale does it again!” screamed broadcaster Adam Amin. Greg danced louder and longer, the celebration “not PG,” he says. He heard from friends he went to high school with in Nigeria. That’s how far his daughter’s exploits spread. The first shot happened on Good Friday; the second took place on Easter Sunday. Was it luck? Divine intervention? Nah. Arike’s buzzer beaters, like all buzzer beaters, didn’t just happen in that moment. They were the product of so many other factors. Now, whenever he’s feeling down, Greg likes to pull up the video of those shots on his phone, to remember the weekend when all seemed right with the world. He still cringes, still shouts when the shots go in. That’s his baby, he says.